Sydney's most natural body of landbound salt water is Port Hacking. Located on the southern outskirts of the city, Port Hacking is a waterway that starts at the Tasman Sea (Pacific Ocean) at Cronulla and runs inland to about Grays Point (about nine kilometres away) where its name changes to the Hacking River which continues upstream to the weir at Audley (another 5.5 kilometres) within Royal National Park. The Hacking River actually restarts the other side of the weir and continues further within the national park. The Hacking River is the only real waterway feeding into Port Hacking. The vast majority of the catchment is within the national park and only a small section contains housing and thus, pollution. As such, the water of Port Hacking is generally quite clear. 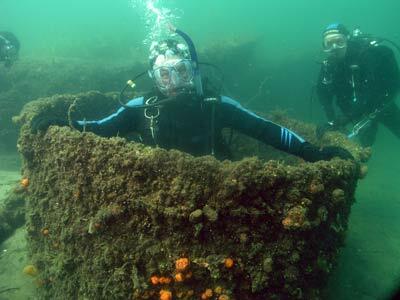 Within Port Hacking there are a number of very good dive sites. These include Oak Park and Shiprock. Another site is Lilli Pilli, about 4.2 kilometres from the ocean. This is a dive along the edge of the shore on the western side of the suburb of Lilli Pilli, under some moorings and along a swimming enclosure. To find this site, travel to the suburb of Lilli Pilli via Caringbah. Once at Caringbah, head down Port Hacking Road South till it branches off into Lilli Pilli Road (there are some shops here, including a nice cafe that we visited after Shiprock and Lilli Pilli dives). Go right to the end of Lilli Pilli Road where you will find a small turning circle. On the right there is a tarred roadway that runs parallel to the water's edge. The roadway has a gate across it that should be open during the hours 6 am to 10 pm. Go down the roadway and you will find parking spots (right-angle and then parallel). Park as far as you can down the roadway. There are a number of walking paths that come off this section of the roadway. The first two lead to a wharf and the swimming pool. The third is the normal start of this dive and is found right at the end of the roadway. On your first visit, walk to the end of the roadway and down the rough set of sandstone steps. Ahead you will see a boat ramp that is the property of the local Sea Scouts. There is no apparent impediment to divers using the ramp and the sea scout supervisors have always permitted us to use this access when they have been on site. Have a look at the site, left and right, before returning to the roadway. Walk back to the access to the wharf and go done and check it out. This will give you a better understanding of the layout of the site. Return to your car and gear up. Once geared up, go back to the ramp. Enter the water on the left side of the ramp or walk very carefully down the ramp (it is sometimes very slippery, try sticking to the edges of the ramp). Don your mask and fins and sink to the bottom. The depth is about two to three metres about five metres off the ramp. Head west and the depth goes very quickly to 5 to 6 metres and then 9 to 10 metres and shortly after 12 to 13 metres (all depths are approximate high tide depths). In late 2006 and early 2007 near the first drop off to about 5 metres or so, there was a smallish turtle living here. He was here since at least early December 2006 and till here mid-January 2007. 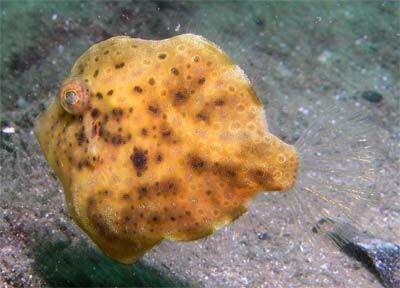 He spent time under the large overhangs in this area, occasionally surfacing for air. He was also been seen in the pool (see later). I was also told by the Sea Scouts supervisors that there was another larger turtle in the area at the same time. I had seen a larger one at nearby Shiprock around this time but I was not sure if they were the one and the same. The one at Shiprock was certainly not the one we saw here. As you go, the bottom is mostly sand with some sea grasses and small rock ledges. Check all the small ledges for interesting things. Once at the 12 metre mark, turn right and you will head in a north-west or north-north-west direction. Head over the sand and it becomes silt and then you will encounter some isolated rocks and then large rock ledges. Examine all of these, looking for eels, cuttlefish, nudibranches, red indianfish and the like. 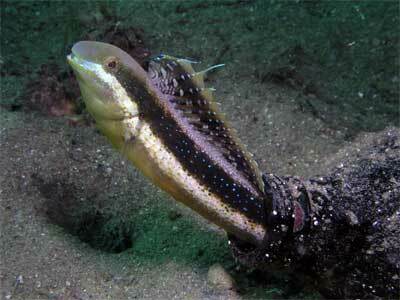 We have seen two pineapplefish here (March 2007) as well as a lot of squid. If the visibility is good (and it can get to over 15 metres), head west and drop deeper to 20 or more metres. From here you can head north and north-east and will end up in the same area as the next paragraph. Keep heading in this direction and you will see some mooring blocks and chains (some in very poor condition). Keep going and you will find the depth gradually shallows out to about five metres. In this area you will see the pylons from wharves next to the houses. Depending on how far you have gone, you may see one wharf that has a huge pile of sherry bottles dumped from the wharf. These are quite old. We figured that the wife must have been a closet drinker and disposed of the empties here so her husband would not know. There are also old stone bottles that contained soft drink (probably ginger beer). These are not the small ones normally seen but huge one gallon bottles. Unfortunately they are all broken, they would have been great to salvage. Turn right and head back towards the swimming pool. Keep to about the five metre level. There are more wharves to examine. As you approach the pool area, you may find a huge cauldron-like object. This is sitting upright, about two metres across and 1.5 metres high. Who knows what it is and how it got here? This is actually almost straight out from the ramp. From here, head south and drop to the six to eight metres depth range. You will hit the swimming enclosure net after about 40 metres. Depending on the place where you hit it, you may see a large pylon that holds the net in place. Follow the net to the right (keeping it on your left). Examine every metre, this used to be one of the best places in Sydney to find sea horses and the net was the place they mostly live. However, since 2010 there has not been large numbers seen. Previously, you could see up to 10 on a dive without too much trouble. 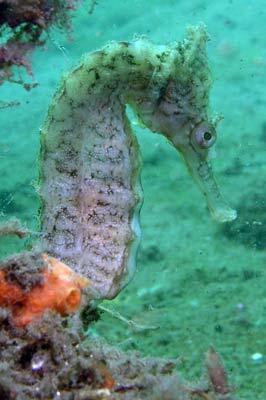 I have seen up to 63 sea horses here on one dive (April 2005) as well as 37 in December 2004, 30 in July 2004 and 27 on an earlier one, including one baby about 10 mm long. I have seen at least 20 on every dive I have done here. There are also many "pregnant" males in December/January. So far, all the sea horses I have seen have been White's sea horses. On 1 January 2004 and 9 December 2004 I saw two very pregnant males. However, in January 2007 I could only find seven and in October 2007 eight on the net and one other. I suspect that the numbers have dropped for the following reason: The net had become so covered in growth that there is very little net showing. 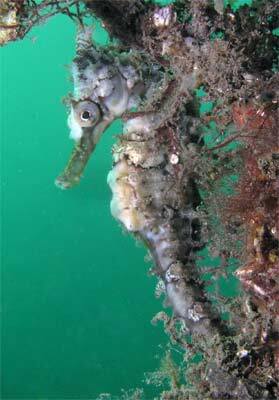 This reduces the places that the sea horses can hold onto with their tails. Clifton Gardens in early 2007 was the same. Note, in the week before 13 August 2011 the net was replaced with a totally new net. On this day there was not a bit of growth on the net. The old net was deposited on the seabed outside the new net. Even in May 2013 the net has no growth at all. As such, there are no sea horses here at all now. The main section of net runs roughly north-south. In June 2011 about half way between the first and second pylons, about 7 metres off the rock ledge, we found a black striped anglerfish. At the southern end of this section of the net there are some pylons (there are corner pylons for the swimming enclosure) which are part of the small wharf. Be careful along this section of the dive (especially under the wharf) as there are hundreds of bits of fishing line all over the place. There are at least two large garbage bins off the wharf. The depth is about four metres at the wharf and comes up to the shore if you keep following the net (there are two more pylons about here, one either side of the net). Turn around at two metres or surface for a look about. Follow the net back (keeping it on your right). Turn right at the first corner pylon and then right again at the second corner pylon. Again you will encounter two pylons (either side of the net). You can go shallower if you like, but return to the pylons. There was a huge hole in the net (as of early January 2007 but fixed a few days later) that you could put a Collins class submarine through. In October 2007 there was another on the deeper side. Nearly every dive there is a hole. If there is one, go through the hole and check out the inside of the pool, especially the net and the rocks just near the hole. You can also go over the top of the net at very high (1.9 and 2.0 metre tides). Once you come back out of the pool, head north for a few minutes. Explore this area again before turning back and then to the east. You should surface near the ramp. Crawl up the ramp well pass the slippery part and remove your fins before standing up. Visibility at this is is never going to be great, but it can be okay. The best visibility should be at high tide but I have also had very good visibility on low tide. I am not sure of the exact time of high tide here in relation to Fort Denison high tides (Sydney Harbour). It will be at least 20 minutes after Fort Denison, as this is the time at Shiprock which is about 2.4 kilometres to the east (closer to the ocean). I would guess about 30 to 40 minutes as this site is twice the distance from the ocean. However, from my experience, the status of the tide does not really impact on the dive as far as currents (unlike Shiprock). This site has some very interesting fishlife. Things that can be seen include, of course, sea horses (both short-headed and White's), as well as yellowtail kingfish, numbray, moray eel, cuttlefish, eastern fortescue, eastern rock blackfish, luderick, stripey, blue groper, Sydney cardinalfish, bream, snapper (juvenile), yellowtail, goatfish, chinaman leatherjacket (juvenile), cuttlefish, octopus, striped catfish, whiting, numbrays, small rays and pufferfish. Of course, as of January 2007 you could also see a turtle. Other fish that are likely to be found here (but not yet seen by me) include pineapplefish, pipefish, red indianfish, flathead and flounder. In summary, a very good dive site, especially at night and if you look for the macro life.